We are so excited to announce that the Arise Home is expanding! We have been approved by social welfare to take two more girls into the home. Arise Africa has a "Risk List" of children that we try to watch in our schools. Most of these kids are orphaned and have lost at least one parent. Some of them are ill with HIV and don't have anybody caring for them. Their living situations are harder than most, and sometimes are nomadic bouncing from house to house or even sleeping on the school hallway floors. Arise Africa is welcoming Stella and Enny into the Arise Home this week! Stella is 13 and currently in the 5th grade. Stella's father passed away years ago and her mother has been caring for her. In January, Stella’s mother informed us that because of her deteriorating condition with HIV, she was no longer able to work, and therefore no longer able to afford their rent or food. Her only solution was to move to a remote village where relatives could look after her and care for her as she rapidly declined. That would likely have been the end of school for Stella and would have affected her. But fortunately she was in our child sponsorship program at school and had her school fees being paid for and she was receiving a meal a day through Arise Africa. Stella is also ill and takes herself to the clinic for her medicine and checkups. A Good Samaritan from within the community stepped in and took Stella in in during the 1st week of February. Although Stella has a place to stay, they are not able to afford to feed her or care for her medical needs. Stella only eats through us and we are the only ones watching out for her. Stella will live with Arise Africa permanently starting in mid May in the Arise Home. Enny is 10 years old and in the 4th grade. When Enny's father died, her mother moved to a remote village. She left Enny in the city determined for her to still receive an education at school through the Arise Africa child sponsorship program. Unfortunately the mother disappeared. Enny has been fending for herself since last December. Therefore, on the first day of school this year, Enny was homeless. An immediate, temporary solution was needed and found, the school janitor. As a widow who has struggled to raise 6 children herself, life has not been easy for the school janitor, but she has a generous heart and took Enny without a second thought. The school janitor was elated that Arise Africa would take Enny in. She wishes she could care for Enny because she is a humble and polite girl - was a delight to have. Enny is also very hardworking and responsible. through all of this Enny always came to school with a clean uniform. And while at school, she is continually focused on getting good grades. Her favorite subjects are Math and English. Her favorite color is pink. One of her favorite things to do is jump rope. 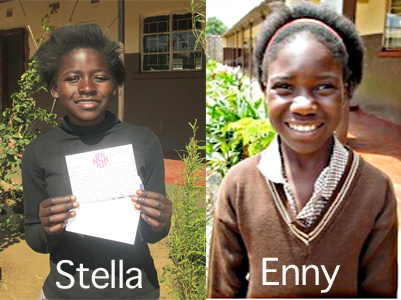 Both Stella and Enny need sponsors in order for them to live in the Arise Home. We are needing about 7 to 8 sponsors per child and the cost to help them starts at $50 per month and can be more if you desire. You will receive bi monthly updates on the child and a photo. You also will have a chance to write them, in fact we need your letter now if you want to sponsor them so we can take it over in June! You money goes to the girls school fees (private school), food, staff salaries who raise the girls, medical costs, clothes, and other costs associated with the Arise Home. Will you help us change these girl's lives?! Please email alissa@ariseafrica.org if you want to sign up to help sponsor a girl and let us know which one. We can get your payment set up today and would love for you to start to get to know your child better! no matter what, we ask everyone to help pray for our two new precious additions to the home! Pray for easy transitions, the other kids in the home to accept and love these girls, and for our house moms to instantly connect!